The pressure on the athlete to be the best is enormous. From childhood with the first forays into competitive sport, the need to excel is manifest and probably hard wired. Clearly, Neanderthal man survived by being the fittest, strongest, fastest and ultimately, smartest. These adaptations occurred through mutations and became part of the DNA substrate via natural selection. Over the past 100 years, it is unnatural selection that threatens millennia of evolution through the use of illicit drugs in sport. If there is a shortcut, today’s modern version of primitive human will find it in a world not known for its delayed gratification but for its instant disposability. Humankind has a history of wanting to feel good through achievements. Evolution depends on it. There is a satisfaction and pleasure with a task well done, whether it is cerebral or physical. In the world of sport, it is the physical attributes that dominate as we provide an arena for competing to discover who is the best of the best. Then we reward them: psychologically, personally, financially and in some cases, religiously. To realise that one is the best in their chosen sport in the entire world must be something to behold. The narcissism to the ego unparalleled, as only a few can claim such an exalted position. It should be no surprise then, that an athlete will do whatever is necessary to attain the pinnacle of perfection. There is the traditional way, through hard work and practice and training. But ultimately, there is a physiological limit to the combination of inherited biology and training. What if one comes up short? For the ultra competitive athlete, near enough is simply not good enough. The human body is a breathtaking example of elegance and power. Unfortunately, for most, only as a source of inspiration and aspiration. The athlete epitomises and symbolises what the rest of the human race fantasises about and aspires to regarding the physical. A collection of organ systems, with their own structure and function, in turn broken down into specific processes, chemical reactions, then individual components, cells, DNA…you get the reductionist drift. Modern sports science measures these systems and refers to them as performance indicators. They themselves are then measured against the individuals’ previous results, other athlete’s results and ultimately a set of idealised parameters or mathematical algorithms to achieve maximum efficiency. There are basically two ways of looking at the physical components of a system that interact with each other: quantitative and qualitative. That is, the number of individual units available to interact and then the quality or how well they carry out their function. As stated previously, there are “natural” ways to improve quantity and quality, but there are limits. The obvious answer is to introduce some exogenous substance and introduce it into the system to affect physiology. This is the therapeutic success of modern medicine, when systems are dysfunctional and need to be repaired. In modern sports, there is no initial dysfunctional or impaired system. Unless there is injury. That introduces a new concept: the pressure to shorten injury time and to restore a system to its maximum functioning. The irony is that this upper limit becomes artificial in the realm of the drug user. The further irony is that, the use of drugs in the recovery process can cause further injury, leading to a cycle of inevitable destruction. Both physically and psychologically. In my view, the introduction of any substance that alters a physiological system should be classed as a drug. It does not matter whether it is a vitamin, a plant, “natural” substances (presumably found in nature somewhere) or synthetic. It is a matter of definition. The net effect is the same: some aspect of a system is altered, either quantitatively, qualitatively, or both. Drugs are often defined as to their primary effect: psychoactive (nervous system), recreational (pleasure seeking), pharmaceutical (medicinal use), illicit (legal definition). Collectively, they still share common traits: all have the potential to act on other systems either in an enhancing or detrimental manner (side effects) and all have the potential to lead to addiction (physically or psychologically). In psychiatry, the DSM (Diagnostic and Statistical Manual)-5 classification system recognises 10 separate classes of drugs in its substance related and addictive disorders: alcohol, caffeine, cannabis, hallucinogens, inhalants, opioids, sedatives, hypnotics and anxiolytics; stimulants (amphetamines, cocaine, and others); tobacco; and others. They are not absolutely distinct. Drugs taken in excess directly activate the brain reward system, involved in behavioural reinforcement and the production of memories. So much so, that normal or usual activity may be suspended. In sport, there are many components to the complex issue of drug use. The athlete, the drugs themselves and their administration, drug supply, the club or sporting body and its culture, wider organisations and their governance, society in general and its level of tolerance. To fix the problem, it must firstly be understood. The consumption of drugs in sport is, in itself, a process consisting of a number of separate systems, in turn made up of separate components. Why do some athletes decide to take drugs and others do not? Does every athlete, given the right circumstances, default to taking drugs? Or are there those who are absolute in their morality and convictions? It is easy to forget that the athlete, despite being one of many in their sport, has their own pre-morbid personality. Cognitions, behaviour, adaptive styles, strengths and weaknesses in their character. They are a product of their biological, psychological and socio-cultural backgrounds. As such, they can be narcissistic, histrionic, antisocial or psychopathic, avoidant, dependent, passive-aggressive, schizoid and others. This is before sport is introduced into the equation. Success at sport therefore means different things to different personality types. In childhood, where biology has more plasticity, it is likely that the biological substrate of personality is already evident. The introduction of sport and its requirements individually and team oriented, can augment or diminish certain personality traits, presumably depending on the level of success and value. In adulthood, unless someone is psychopathic, devoid of morality and conscience, most will debate the decision to use drugs to enhance performance or hasten recovery. The pressure that may apply to the athlete, either internally or externally, to continuously produce maximum performances is enormous. Externally, this may take the form of teammates, the coach, the club, friends and family. It may also include one’s livelihood, monetary gain, sponsorship, and other reinforcing benefits. Ultimately, however, it is up to every individual to decide whether they will take drugs to improve performance or not. No-one else. Unless there is genuine sabotage or pathological lying by other individuals. Even so, the athlete is deemed to still have some responsibility regarding their actions. In today’s information based society ignorance can no longer be seen as an excuse. The level of responsibility is the frustration and the ongoing source of continued debate of what is acceptable, often with legal ramifications. Psychologically, once an athlete crosses that moral divide, I suspect the decision is rationalised so that it somehow becomes acceptable, even justifiable. The internal opposition has been defeated. There are so many that will benefit from the decision. It is time for addiction, psychological and physiological, to begin. In sport, the drugs that form the principal objection are those deemed as “performance enhancing”. Ironically, the aim in sport is to enhance performance to reach a maximum, defined by a number of stake holders. Society demands excellence. Individuals identify with the sporting hero, or team, to compensate for their own failures. But there are conditions. So long as it is achieved through hard work and dedication only. The value of overcoming adversity, through character and strength alone. Not to supplement the process by drug use. Since sport has been part of history, so has the need to improve performance. From the Neanderthal, Roman Gladiators, the Ancient Greek Olympics to the modern day version, substances have been taken. Originating from herbal infusions and other plant extracts, meat and gonadal supplements, to the more “civilised” synthetic laboratory products. Mysticism has been replaced by science, at least in some cultures. So which systems are to be targeted in sport? The musculo-skeletal, the neurological, haematological and endocrine are primary. But since the body has systems that interact, they are all potentially open for improvement. The mode of delivery is important, but any orifice will do to get into the mucosal lining for absorption. Less efficient would be skin application. More efficient would be direct transmission into the blood stream. Even better, the holy grail, would be specific end targets exclusively. This is the future realm of nano-technology, which sport will have to address soon. Drugs that affect the musculo-skeletal system are the anabolic steroids. Essentially, they increase muscle mass and strength. Side effects are multiple and potentially lethal. They include hair loss, testicular atrophy, clitoral enlargement, gynaecomastia, hypertension and hepatic dysfunction. Drugs affecting the neurological system are the stimulants. They modulate mental functions and behaviour, improve alertness and reduce fatigue. The haematological system includes the use of EPO (erythropoietin), which increases the number of red blood cells and hence improves the delivery of oxygen to fatiguing muscles, especially relevant in endurance sports. Another method would be the use of blood transfusions. HGH (human growth hormone) is a peptide hormone that stimulates growth, cell reproduction and regeneration. Potential side effects include diabetes and lymphoma. Drug chemistry and its use in sport is difficult to eradicate. The type of drug, its specificity, mode of delivery and increased sophistication is mirrored by the advances in technology including detection. A competition in their own right, in the pharmacological arena. Who wins and loses is a matter of opinion and moral perspective. An athlete, if part of a team, has a reference group. The unification of individuals under a common sport is a powerful force. From childhood onwards, the collective team ethos is an important learning experience and can set the tone for decisions in adulthood. The team’s belief system is important in an athlete’s decision making. Especially if it is being emphasized by the leader of the team, the designated captain. If this person is respected for their on-field qualities and exploits, then in the role as mentor and role model their opinion will be respected and followed. This is easier if the athlete’s own view coincides. For the younger player who is naive and inexperienced, the decision to take drugs may be influenced by the teammates and the wish to seek approval and to be included, irrespective of their own ambivalence. It would take enormous strength to oppose the collective pressure of a peer group, no matter where and when in life it occurs. The sporting club or association has many elements. There are many people involved, but there is still a structure. Within that structure there are designated roles and relationships. There is also a code of conduct and expectations set out by the club hierarchy as to performances, both on and off the field of sport. Great clubs know what the roles and relationships are, defined by their rules and regulations. Enlist the “right people”, and the engine runs a lot smoother. From the board, to the CEO, to the various components within the business structure, all must adhere to the principles that the club philosophically upholds. If not, chaos and disharmony ensues. When it comes to drug use, the medical staff should have the main role in overseeing any program. Certainly, this can be in collaboration with other allied professionals, but the final decision should rest with the club doctor. They are specifically trained in the structure and function of the human body, pharmacology, sports science, and often have had further study or years of experience in sports medicine. Presumably, they are also morally responsible for what is best for the athlete, as well as being legally responsible should any decision be adversarial. When it comes to the physical and psychological welfare of the player, the doctor is in charge, as is the expectation in society. Any deviation on medical matters by the coach, the board, the owners, or stakeholders is a recipe for disaster. In recent years, the sports scientist has emerged. A mixture of cutting edge techniques and systems that seek to elevate the performances of players, but legally within the guidelines. Any innovation must be the subject of severe scrutiny, especially if it involves the introduction of substances to affect performance. First and foremost, it must be proven absolutely that no harm will come to the athlete. The evidence for benefit must be rigorous and the research of a high quality and not simply anecdotal. It must also comply with existing drug codes, both locally and internationally. There must be transparency in the entire decision making, from medico to CEO to board. The governance of a sporting club should always have the athlete’s health as its primary focus. Some within may argue otherwise, focussing on success and wealth as preferred options. Not at the expense of health. The club also has other responsibilities in player welfare. Education is paramount. Leadership is powerful. A policy for drug detection must be absolute in clarity and understood by all concerned. Players should be tested regularly and randomly, ideally by both the club or organisation as well as any independent sporting body specifically designed for that purpose. Monitoring of samples must be stringent to avoid collusion and fabrication. Finally, the consequences for drug use must be clear in terms of due process. The question is when is diligence and vigilance ever enough? Until the next positive sample. It is important at this point to consider the athlete that is caught with an illegal substance in their system. Given no system is perfect, there is scope for error. Usually, probability will determine the merits or plausibility of the situation. One thing is sure, denial is a powerful defense mechanism and admission of guilt is rare. Also, the psychological state of the athlete must be addressed, given the propensity for anxiety and depression as sequelae. Even the sociopath will feel defiant but injured on being caught, not the effect it has had on others. How many times have individuals expressed contrition after the event, hoping an admission limits the condemnation and absolves them of the crime? Absurdly, they are often applauded for their honesty. Where was the moral conflict when the crime was being committed? Absent until one is caught. Clearly, such a complicated problem itself requires consistency and a coordinated movement. Enter WADA, the World Anti-Doping Agency. Its existence since 2004, is to provide a framework to stop the use of drugs in sport that are morally unacceptable because it negates the notions of equality, fair play, respect and other noble notions that are associated with sport. Ultimately, a moral decision has been made that any exogenous assistance to improve performance is unacceptable. This position also has application to suit design, equipment and other innovations that provide an unfair advantage through technology. WADA works with other agencies worldwide to coordinate anti-doping policy, rules and regulations within sports organisations and government authorities. It provides guidelines. There are lists of substances that are prohibited at all times, prohibited in competition, prohibited in particular sports. Specific substance list and methodology are also listed. Clearly, the list is being constantly revised and amended as new drugs appear especially “designer” drugs. In a moral sense, it depicts forces of good against evil, as proponents of both would agree. WADA also adopts a position of “strict liability”. In other words, the athlete is ultimately deemed responsible for the sample test, where and when, whether intentional or not of a doping violation. The result, if in competition, is invalidated. Further sanctions apply, but there is room for flexibility and severity based on argument and appeal. The burden of proof, rightly so, rests with the athlete (and presumably their legal team). The enduring question is how many chances does an athlete deserve? In my view, there should be consequences whether it is the first, second, third or more, of increasing severity. Monetary fines have little impact. Suspension from the chosen sport, perhaps for increasing periods, would seem more appropriate. Along with the role of education and other forms of psychotherapy, especially for a first time offender. If an athlete feels aggrieved, then the system should provide a legal alternative for argument, as is the right of any person in society. As a parent body, WADA has an important role to disseminate information and to make sure its own processes are the subject of scrutiny and research. This is essential if they are seeking an alliance across different sports, different agencies with their own lists and agendas. More than 660 sports organisations have adopted the WADA code. Acceptance, implementation and enforcement are the processes involved. One thing is assured; there is no excuse for a lack of knowledge or information, especially if the role is given to the medical personnel advising an individual or team. Finally, the role of society and its influence cannot be understated. It is often said that sport is a microcosm of society and its values. This is true to some degree, but there are important differences. Sport is a complex psychological and socio-cultural phenomenon that provides respite for the hardships of an individual’s life, as well as fulfilment of fantasy. In this sense, when it comes to drug use, the overall stance is that it is to be condemned. There is a peculiar relationship between drug use in sport and drug use as recreation. As much as we try to make the distinction absolute, often through the legal system, it is not that simple. Should exactly the same consequences apply to an athlete caught with recreational drugs as the non athlete? What is the difference between recreational drugs and performance enhancing drugs? Taking an anti-anxiety drug to be able to sit an exam is allowed, if not advisable for some with overwhelming “performance anxiety”. Taking the same before a race is not given the same allowance. Should we ban anti-depressants, anti-anxiety drugs, etc. Perhaps the difference is a medical argument: the restoration of a diseased system to its optimum and usual biological functioning; not the elevation of a normal, healthy, functioning system to an artificial and superhuman level. 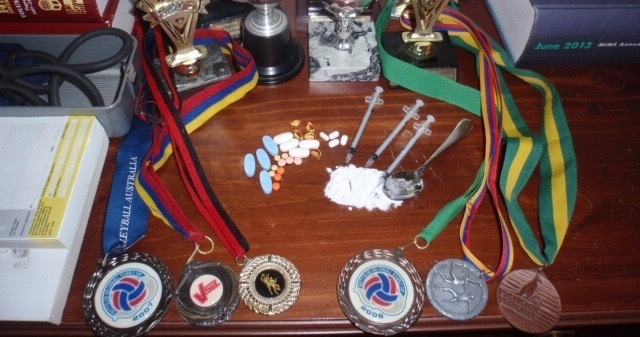 Clearly, drug use in sport and society in general is a complex process. There are many strategies in place to combat the problem. Ultimately, the problem would not exist unless there was a demand. The demand is essentially a human one, to feel good. All the time. Instant gratification based on immediate results. We place a premium on satisfying our primitive urges of pleasure, narcissism, success, beauty. To become fitter, stronger, faster, younger. If there is a way to literally and metaphorically speed up the process, then who has the right to argue otherwise?